Filippo Musca, Deputy Director of the Siracusa International Institute for Criminal Justice and Human Rights, attended on April 5th in Pristina the Second Steering Committee of the Twinning Project “Strengthening Efficiency, Accountability and Transparency of the Judicial and Prosecutorial System in Kosovo”, funded by the European Commission. The project is conducted by the Italian High Judicial Council in cooperation with the Italian Ministry of Justice; the French Ministry of Justice, represented by Justice Coopération Internationale (JCI), is junior partner of Italy. The Siracusa Institute is the ad hoc mandated body of the Italian High Judicial Council (CSM) supporting the scientific and logistical management of the project. The Committee was also attended by the projects leaders, Mr. Giulio Adilardi, Mr. Yves Charpenel, and Mr. Lavdim Krasniqi; the EU Office Task Manager, Ms. Julia Jacoby; the Chair of Kosovo Judicial Council, Mr. Nehat Idrizi and the Chair of Kosovo Prosecutorial Council, Mr. Blerim Isufaj. 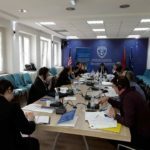 The Siracusa Institute attended also the First Steering Committee of the project, which was held in Pristina on January 18th, and the Kick-Off Meeting, which was held on March 3rd.